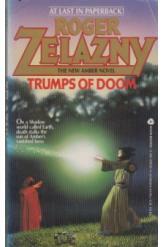 Trumps of Doom by Roger Zelazny, Sci Fi. Book is in good condition, all pages intact. Merlin, son of Corwin of Amber, has been hiding under the name of Merle Corey in our own world's San Francisco. His quiet seclusion is ended when someone from another world attempts to kill him, and a race through the Shadow and between the worlds begins. Part of the Amber series.